There’s a new program called 7Stacks that lets you add stacks of icons to the Windows taskbar (aka the “Superbar” in Windows 7). 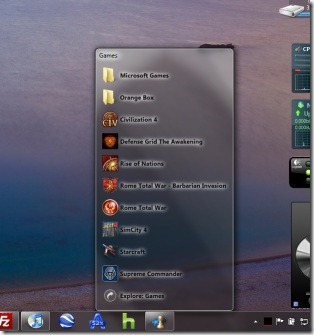 Instead of launching a program when you click the icon with your mouse, you’ll see a list of programs appear in an Aero-style menu. The software offers handy way to clear up clutter of icons off your desktop while also not using up too much toolbar space. Those who want an easy shortcut to their frequently accessed folders and files will like 7Stacks too since you can use it to pin exact folder locations to the taskbar. This is different than how Windows 7’s built-in “Libraries” folder icon works. 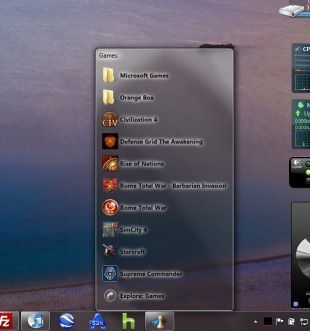 When clicking that icon, which appears next to the Start Menu in Windows 7, Explorer opens. However, your frequently accessed folder locations are available only on right-click. With 7Stacks, you can create a list of folder locations which pop-up upon a left-click instead. 7Stacks also allows you to configure the stacks in three different formats: normal, grid, and menu. Normal displays a vertical stack, grid shows a square-shared grid of icons only, and menu is a cascading menu of items with very small icons labeled with text. Perhaps the nicest thing about 7Stacks, though, is the way it uses the Aero technology for displaying the stacks. This makes it look more like a feature included in Windows 7 itself and not some extra add-on program. 7Stacks is a free download available here.